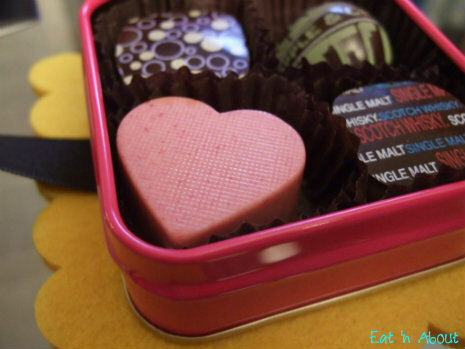 ChocolaTas – A holiday giveaway!! Update Dec 18, 2012: Amanda you’re the winner! Make sure you check your email for a message from ChocolaTas!! Congrats!! Chocolatas is headed by belgian chocolatier Wim Tas and his wife, and have setup shop both at Granville Island and in Abbotsford. They boast all natural ingredients and also no preservatives, so their chocolates come with a suggestion to consume within 7 days, which should be no problem! 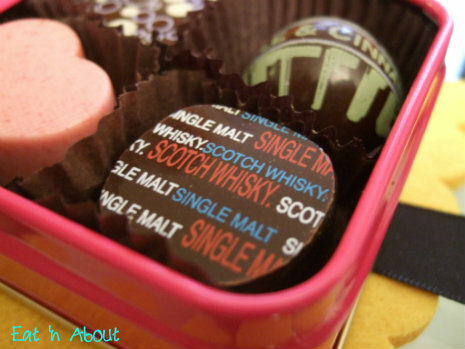 The sample pack we received consists of the flavors Single Malt Whisky, Romana, Lavender, and Apple & Cinnamon. First up was Single Malt Whisky. Now I’ve never had whisky before, let alone know the difference between single or double or whatever amount malt. However I can say that there was a noticeable amount of alcohol content aroma-wise in the dark chocolate ganache…Hitman said he could smell it as I was eating it. Not enough to get tipsy off of of course, but it’s there. Not saying it was bitter either. 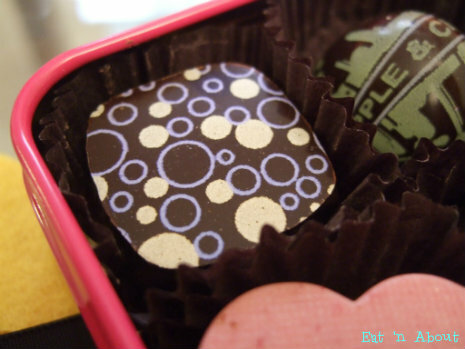 Romana was supposed to be dark raspberry ganache enrobed in raspberry chocolate. However there was little raspberry notes to speak of. It was tart-ish but that’s about it. Beautiful presentation though. Lavender was next. Described as a subtle touch of light, fresh lavender, I actually felt the lavender notes were quite strong. Hitman even goes on to describe it as perfumey. It did not bother us though as we’re both fans of the fragrance. However if you’re not, stay away. 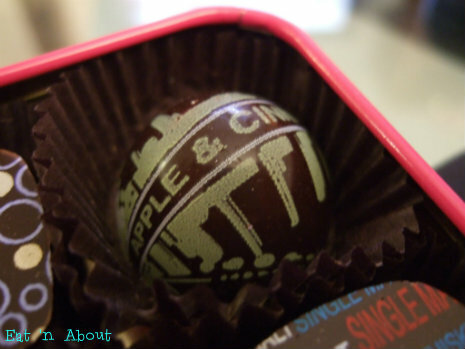 Saving the best post for last, Apple & Cinnamon was part of their “caramels” line. This was probably the most realistic and flavorful one out of the sample box, due to the ease of adding flavors to the caramel part of the chocolate. It actually tasted like you were eating apple pie filling but it was not overly sweet, ironically. This was our favorite. 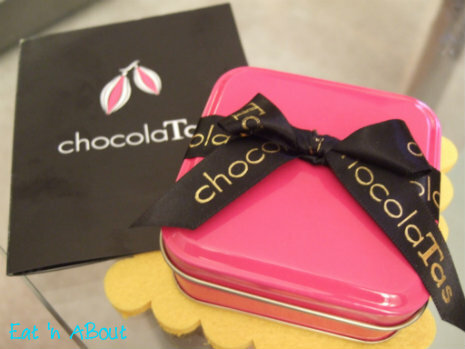 In the end, I will have to say that ChocolaTas treats are very true to their flavors and these are quality chocolates. Best of all they’re handmade with care locally and they’re extremely pretty to gift!! My only fault with them, and this is a personal observation/preference thing, only realized because Hitman and I had to share each chocolate, was that the bottom of the chocolates tend to break off in a whole plate piece causing a mess to share, especially with the caramel varieties. I’m sure this is due to the fragile nature of the assembly of the chocolate itself and really isn’t a fault, especially if you don’t intend to share in the first place! Anyways now comes giveaway time! We were instructed that 15 days from the posting date of this entry, anyone that enters the survey here within the allotted time will be entered to win a sample box of ChocolaTas treats of their own!! This means you will have to enter the survey by Dec 18, 2012. Unfortunately this is open to Canadian residents only. Once the winner is picked, I will announce it on a new post and ChocolaTas themselves will send off a present for you! !